Red Spoon Thai Restaurant located in Castle Hill serves a range of delectable Thai cuisines. It is conveniently located at Castle Towers which can be easily reached by public transport. The setting of the restaurant is traditional and cosy with an outdoor setting styled around a water feature. This restaurant was one of my Thai encounters as I was casually shopping at Castle Towers one afternoon. Though the prices of the dishes are a bit on the higher end compared to a lot of other Thai restaurants, it is extremely popular as the food is worth it's value. 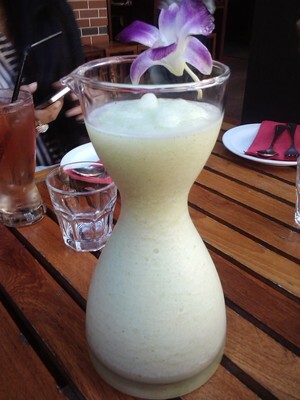 We started with a nice, refreshing cocktail - the pineapple, lemon and mint daiquiri. We ordered a jug between the 4 of us which costed $32. It was a great starter with a very strong pineapple and mint flavour. 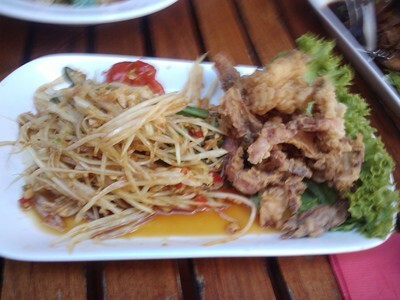 For entree, we ordered a Soft-shell Crab Papaya Salad. It was served on a long plate with a generous amount of shredded papaya and fried soft-shell crab topped with their special sauce and nuts. 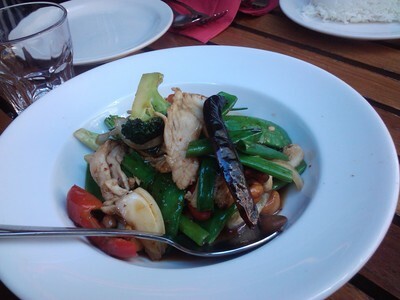 My favourite out of the mains was the Cashew nut stir fry. It was served with a range of colourful vegetables and chicken was well-cooked. 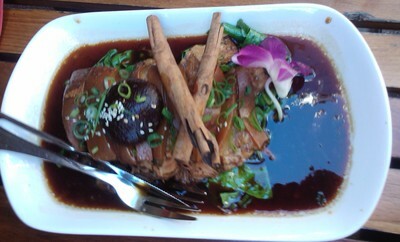 The pork belly was also a standout in presentation but it was a bit too fatty for me. The Chilli Basil Stir-fry wasn't much different from other stir-fries that I have tried in the past but one thing that did amaze me was that they actually fried the basil so it was crispy. I really liked this Thai restaurant and there were so many things on the menu that I wanted to try but didn't get the chance to because there were so few of us. I will definitely be back to try their other dishes next time. The staff were also really friendly and helpful and the food was served really quickly after we had ordered. Red Spoon offers a great environment, great service and great food - what more could you ask for? Please visit their website for more information or to view their menu.